Brian Thomas. Photo By Yulia Weeks. “Well, maybe a dream it was / It’s really hard to tell / But if it’s not, I’d just survived / The very depths of Hell.” So ends the next-to-last section of a 15-part poetic rumination on the Vietnam War written by Blue Ox Millworks founder and Vietnam vet Eric Hollenbeck. You probably haven’t read the poem, because it’s not published yet, but if you tuned into 97.7 FM on Memorial Day, you may have heard a passage or two. 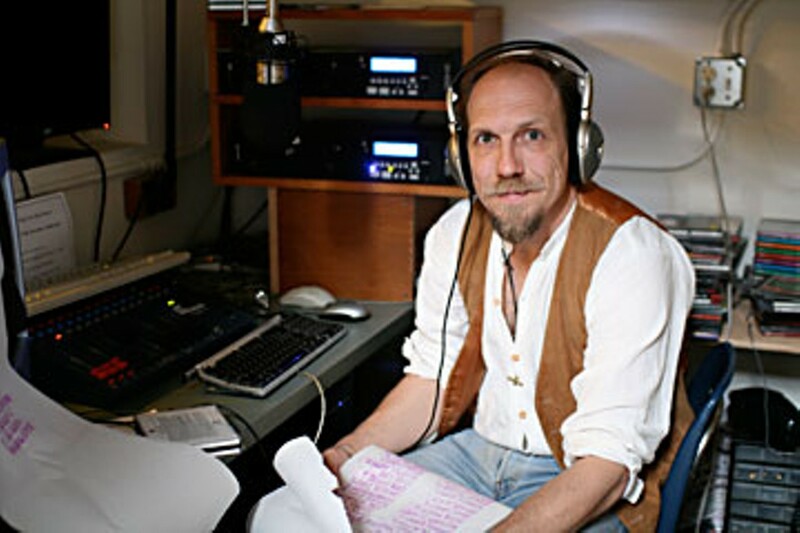 Brian Thomas, a volunteer DJ at Blue Ox radio, spent almost 11 hours on the air on Monday commemorating the over 400 veterans that Humboldt County has lost at war with music and recorded excerpts of Hollenbeck’s epic poem Uncle Sam’s Tour Guide to Southeast Asia, read by the author, young men of service age and other local veterans. 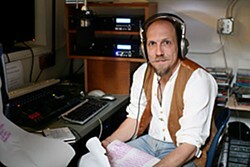 Thomas describes Hollenbeck’s voice as a mix between the sardonic children’s poet Shel Silverstein and Robert Service. The description is apt: The poem is a rare combination of humor and pathos. On Memorial Day, Thomas took a break from his program to talk to the Journalabout his project, which he describes as a work in progress. Starting at noon on Monday Thomas began playing music chronologically, spanning a century of war, from Vera Lynn’s “We’ll Meet Again” to Jimi Hendrix’s version of “All Along the Watchtower” and beyond. But the show’s centerpiece was Hollenbeck’s poem and a list — a necrology — of Humboldt’s war dead. With “Lili Marlene,” an affectionate WW II-era song about a streetwalker, playing softly in the background, Thomas showed me 12 sheets of rubbings he’d made at the Veterans of Foreign Wars Hall in Eureka of soldiers who lost their lives in Europe, Korea and Vietnam. Thomas’ voice was somber. He told me how important it was for him to get the veterans’ names right on the air, in commemoration of what they had given, and as a service to their surviving family members. Thomas never served himself. “I’ve lived a very convenient, happy life and was allowed to actually pursue the career I wanted and not have to worry about military service,” he said. Which is one of the many reasons why he decided to put the Memorial Day show together. Another reason is the importance of not forgetting. He reminded me that there is only one American WW I veteran still alive today, 107-year-old Frank Buckles. In doing research for the show, Thomas discovered that there is no comprehensive list of Humboldt’s war dead — thus the rubbings. Thomas hopes to keep recording veterans reading passages from Hollenbeck’s poem over the next six months in preparation for Veteran’s day come November. He also wants to put together a comprehensive list of the veterans from Humboldt County who died in foreign wars, as a resource for others. Thomas moved to Humboldt a couple of years ago from L.A., where he worked as a researcher for movies. Many of the films he worked on were war films, he said, and that gave Monday’s show extra special meaning for him. “I’ve been part of the machine that occasionally makes [war] look fun and by that token this comes as atonement for me,” he said. Thomas’ regular show, “Not That Kind of Show Tunes,” airs Wednesdays from 7 to 9 p.m. To hear excerpts from Eric Hollenbeck’s poem Uncle Sam’s Tour Guide to Southeast Asiavisit our blog at ncjournal.wordpress.com.